This play is based on Euripides’ “Bacchae” and Robert Burns’ “Tam ‘O Shanter”. The Bacchae was performed posthumously in 405 BCE. Tam O’ Shanter was first published in 1791. Self-educated in the classics, Burns’ poem bears a striking resemblance to the Euripidean tale. 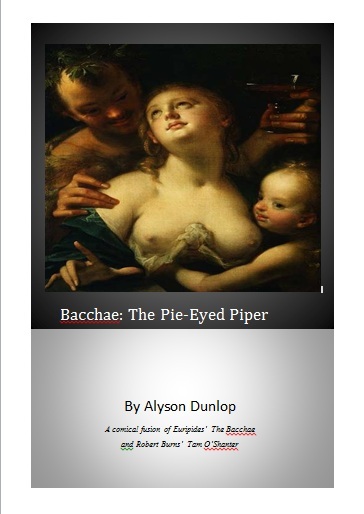 “Bacchae: The Pie-Eyed Piper” was first performed at The Pleasance Theatre in Edinburgh for the Scottish Pagan Federation Conference on 9th June 2007. Purchase now on Amazon Kindle, for only £1.53!